London's Bouncing proudly supports many local and national community organisations annually. All our bouncy castles are rpii tested which means that you can be sure that our castles are compliant with safety standards. London’s Bouncing are able to provide entertainment for all ages. If you're after something extra for your party click more for our fantastic extra's! We provide the best service in bouncy castle hire and supply of helium balloons. Whether you are celebrating a birthday, having a corporate event, a wedding or any other special occasion, we are dedicated to make it a day to remember with our team of expert party planners and choice of beautiful and fun bouncy castles. We are based in London and cover many different postcodes, so please call for a hire quote today and find out about our special offers for more than one day hires. 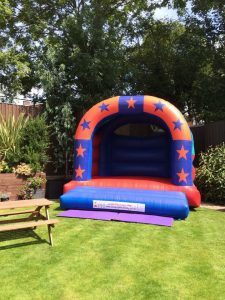 Some great ideas for when to call us for a bouncy castle: Fund raisers, corporate events, conferences, weddings, team building event, birthdays, seasonal celebrations, festivals, church and school fairs, sports days and family reunions. I had my son’s 5th birthday on the 11/05/13. The weather was horrible but Jatin was there on time, answered all my questions and provided a lovely bouncy castle at an affordable price. My son and his friends really enjoyed the bouncy castle. Thank you London’s Bouncing hire and Jatin for providing an excellent service. I would definitely recommend to friends and family. London’s Bouncing provided a fabulous Bouncy Castle for the Queens Park Community School Annual Carnival. They are an excellent company to deal with and we intend to use them again next year. I highly recommend them. I have used London’s Bouncing for a couple of years now and found them to be very professional and accommodating. They have always done a fantastic job in setting up and breakdown of their equipment. Thanks for providing a fantastic service.